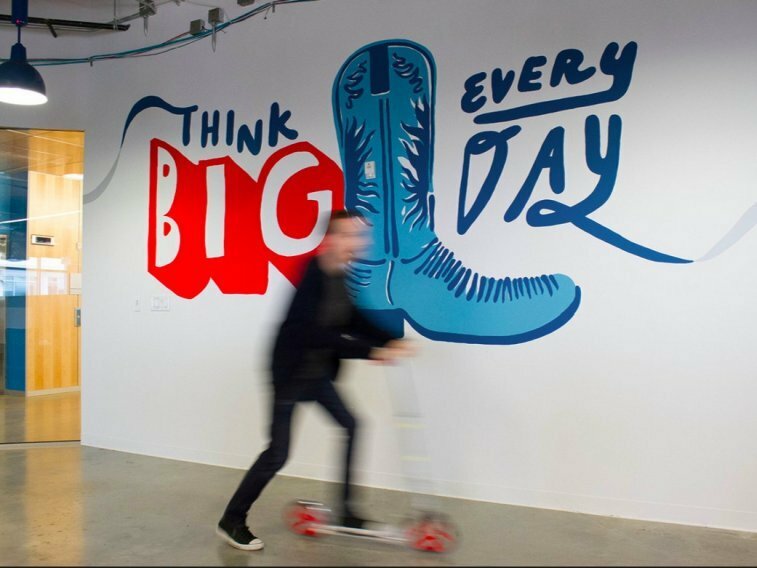 Four months after our first acquisition, I’m thrilled to announce that Bigcommerce is expanding to Downtown Austin! We were looking for an office befitting a startup, with the charm and character that would foster creative work. Our desired location would be nearby other tech startups and in the heart of downtown Austin. The ideal space would have an open seating plan, and have an array of windows for ample natural lighting. And if we could wish for one more thing, it would be a location of significance in the Austin technology landscape. Our search began not far from Capital Factory, the startup incubator. A friend and former colleague of mine works at Mass Relevance (which merged with Spredfast in 2014). She tipped me off to a suite that the combined company no longer needed; it was the office where Mass Relevance began its ascent. We’re so excited about our downtown expansion, and we couldn’t have wished for a better office! We took occupancy this week and opened the office in celebratory fashion — with cocktails, of course! Our downtown office can be considered a satellite to our larger HQ near Lake Travis. But it’s also a testament of how we’re building a unified team across all of our offices in Austin, San Francisco, and Sydney. Just as we’ve done in our other Engineering offices, we plan to give back to the community by hosting meetups on a regular basis. We want to engage and inspire technologists in the Austin area. In the Information Age, nothing is more important than the cultivation of ideas. Our intent is to be a thought leader and a positive influence for the Austin tech community. To all our engineers working in Austin: dust off your boots and hang up your hat. We’ve got work to do! There are a few competitors in our space, but I know we’ll rise to the occasion. And remember to: Think Big, every day (this is Texas, after all).